St. Louis Mayor Lyda Krewson signs a ceremonial transfer document. The federal government in 2016 announced its decision to move the current headquarters from south St. Louis to north St. Louis, after considering multiple locations around the region. NGA director Robert Cardillo told attendees at Thursday’s ceremony that he thinks the new campus will ensure the NGA’s future success. This drone photo taken Oct. 19, shows the planned new site of the National Geospatial-Intelligence Agency in north St. Louis. Developer Paul McKee owned nearly 60 percent of the land in the 97-acre site. Now that the U.S. Air Force owns the land, officials will select a construction firm from among three finalists. The City of St. Louis already demolished buildings on the land and prepared the site for construction. Cardillo said he hopes the project will break ground in about 10 months. U.S. Rep. Lacy Clay, D-University City, said that the project presents a great opportunity for north St. Louis and its historically black neighborhoods. “We hope that this will help a long-neglected sector of the city, the area north of Delmar, to be rejuvenated, to be infused with economic activity,” he said. The neighborhoods surrounding the Next NGA West campus have federal status as a Promise Zone, which puts them first in line to receive federal assistance to decrease poverty and rebuild communities. Critics of the project have said the use of eminent domain to buy up land for the NGA campus shows a disregard for the surrounding community. Charlesetta Taylor lived in the project footprint in St. Louis Place for about 70 years. Taylor opposed the NGA project when it was initially announced and helped organize a petition drive against it. The city moved her 3,000-square-foot home to a corner on St. Louis Avenue, just off of the NGA project’s northeastern boundary — instead of demolishing it to make way for the campus, like it did most other homes. Thursday, she attended the transfer ceremony to show her support for the project. She said she’s excited to see how the area changes. 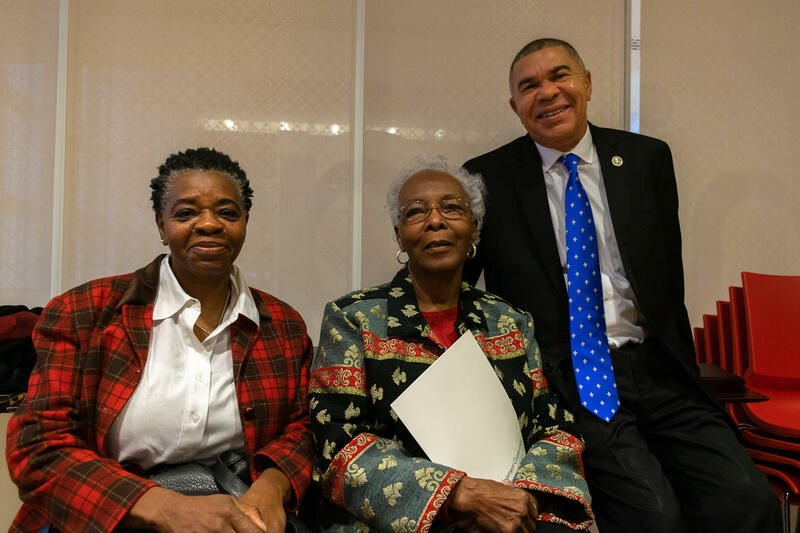 U.S. Rep. Lacy Clay (right) poses with Charlesetta Taylor (middle) and Rose Green, St. Louis Place residents, after the NGA land transfer ceremony. Taylor said she hopes that the project will produce affordable housing that will let longtime residents of her community to continue to live near the campus after the project’s conclusion. Taylor wasn’t the only one with that concern. “I want them to think about the people who are still there. That we don’t get displaced again,” said Rose Green, another St. Louis Place resident. She said she’s acted as a community liaison for the project. As construction proceeds, she said she hopes the federal government will communicate with nearby residents and consider their needs. City officials estimate that the new facilitys will open between 2024 and 2025. Chad Davis contributed reporting for this story.